Southern Syria, or the countries watered by the Jordan. 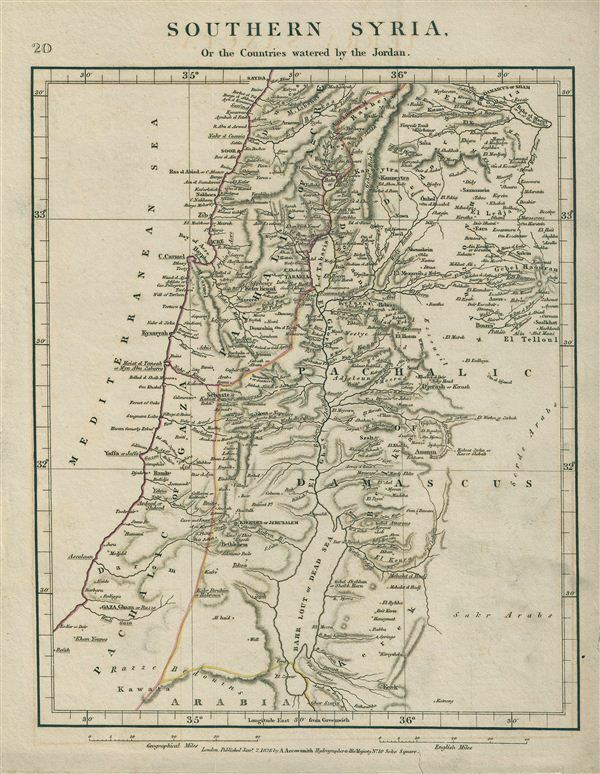 This is a rare example of Aaron Arrowsmith's 1828 map of Southern Syria and the countries watered by the River Jordan. Centered on the River Jordan, the map covers the course of the river from Lake Hula to the Dead Sea and shows the Ottoman provinces of the Pachalic of Gaza, parts of the Pachalic of Acre and the Pachalic of Damascus. These include modern day Israel, Palestine, Syria, Jordan, and parts of Lebanon. The regional boundaries are colored and relief shown by hachures. During this time in history, Syria was part of the Ottoman Empire and was largely ignored by world affairs. This map was published by A. Arrowsmith, hydrographer to His Majesty, in 1828. Very good. Original platemark visible. Blank on verso. Minor verso repair on bottom, right and left margins.